MB QUART FX1000.1 1000W True Car Truck Amp Great Condition! MB QUART FX1000.1 1000W True Car Truck Amp Great Condition!. Condition is Used. Shipped with USPS Priority Mail. I bought this new and now have sold my truck and no longer need it. It works great! Comes with remote control. Thanks!! MB Quart Discus Series DA1-1800.1. Class-D 1-Ohm Stable Monoblock Amplifier. 3-way protection circuitry (thermal, overload, and speaker short protection). Used and in good working condition. The mounting tabs are made of plastic so of course one is snapped off and two more are cracked. Purpose built 1 channel amplifier for driving sub-woofers and sub-woofer systems. Put the completed RMA FORM inside the box with your item. We areNOT responsible for any custom duties or brokerage fees that may apply for all international orders. What you are looking at is a MB Quart RAA 1000 1 channel amplifier made by Rockford Fosgate! Get it while you can! 'MB Quart compact 400 watt mono Powersports amplifier to for a subwoofer with on-board equalization and simple instalation with quick release connectors. MB Quart NA2-500.5 compact 400 watt mono Powersports amplifier to for a subwoofer. MB Quart NA2-500.5 Marine Grade compact 500 watt mono Powersports amp for Sub. MB Quart compact 400 watt mono Powersports amplifier for a subwoofer with on-board equalization and simple installation with quick release connectors. Bass remote included. MARINE GRADE PROTECTION: YES. 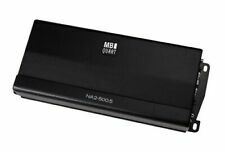 MB Quart NA2-400.1 compact 400 watt mono Powersports amplifier for subwoofers. MB Quart compact 400 watt mono Powersports amplifier for subwoofers with on-board equalization and simple installation with quick release connectors. MB Quart NA2-400.1. Class-D Full Range 2-Ohm Stable Monoblock Amplifier. Ultra Compact design built for powersports applications. Marine and powersports certified. 3-way protection circuitry (thermal, overload, and speaker short protection). MB Quart compact 400 watt mono Powersports amplifier to for a subwoofer with on-board equalization and simple installation with quick release connectors. OPERATION MODE: Mono operation. MARINE GRADE PROTECTION: YES. (1) MB QUART FW1-304 12" 600 Watt Car Audio Subwoofer DVC 4-Ohm Sub. The ideal balance of a high end car audio system requires the perfect mix of speaker tone, deep bass impact and clean undistorted power. (1) MB Quart FW1-254 10" 600 Watt Car Audio Subwoofer DVC 4-Ohm Sub. The ideal balance of a high end car audio system requires the perfect mix of speaker tone, deep bass impact and clean undistorted power. (1) MB QUART Subwoofer Sealed Sub Box Mono Amplifier Amp Kit. The ideal balance of a high end car audio system requires the perfect mix of speaker tone, deep bass impact and clean undistorted power. With MB Quart we make it simple to develop the impeccable Formula for a great sounding system. MB Quart FX1.700 | 700W RMS Formula Series Class D Monoblock Amplifier. AMP CAR AUDIO (ID: 11037931-1 )RSA. Old School MB Quart RAA1000 1 channel Amplifier,RARE,Fosgate,. Condition is For parts or not working.